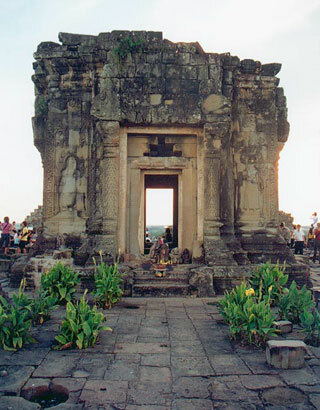 Phnom Bakheng at Angkor, Cambodia, is a Hindu and Buddhist temple in the form of a temple mountain. Dedicated to Shiva, it was built at the end of the 9th century, during the reign of King Yasovarman (889-910). Located atop a hill, it is nowadays a popular tourist spot for sunset views of the much bigger temple Angkor Wat, which lies amid the jungle about 1.5 km to the southeast. The large number of visitors makes Phnom Bakheng one of the most threatened monuments of Angkor. This article uses material from the Wikipedia article "Phnom Bakheng", which is released under the Creative Commons Attribution-Share-Alike 3.0 License.